McKinleyville High’s Assistant Principal Danielle Carmesin and Arcata Police Department’s Juvenile Diversion Counselor Crystal Perez will be facilitating an upcoming Parent Project class. The nationally-recognized Parent Project classes will be hosted on Wednesday evenings from 6 to 9 p.m. beginning October 18 at the McKinleyville High School Library. 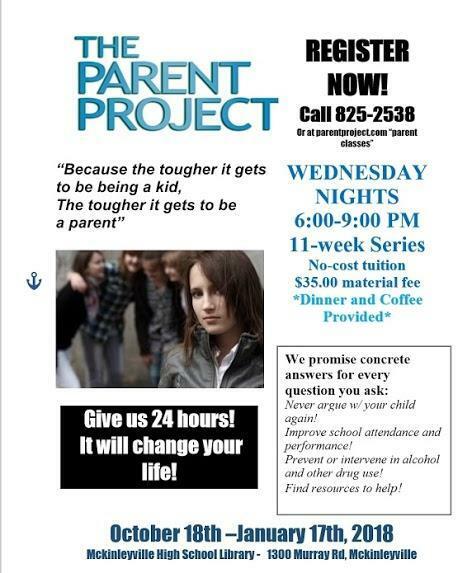 This 11-week class series is geared to help parents improve adolescent children’s school attendance and performance, reduce family conflict, curb drug and alcohol use, prevent runaways, stop violent behavior and develop strong, in-home prevention and intervention strategies for youth gang involvement.